Description: With Amtrak #5 in for its stop, BNSF 5450 leads a Z train East. And as awaiting commuters look on, their train can be seen in the distance on the South track. Busy, busy place sometimes. Description: During our 30 minute helicopter flight over Kansas City, we ran across this eastbound BNSF freight waiting on the flyover at Santa Fe Jct. This offers us a great vantage point of the greater Santa Fe Jct./BN Interlocking/KCT Roundhouse/25th Street/Argentine Connection Flyover/KCT High Line/KAW River Bridge layout. Description: During our 30 minute helicopter flight over Kansas City, we fly over Downtown KC, looking south at Union Station and a train passing through on the KCT. Description: BNSF 5450 is the second of three units on this southbound train. Notice the large yellow "BNSF" lettering on the hood. Galesburg, IL: Feb 5, 2012. Description: BNSF 4837 leaving Fernley after working the siding and heading for Reno. BNSF 4771 serving as DPU. 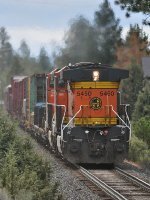 Description: BNSF 5450 East rounds the broad curve at Palmer Lake on a bright june morning as the engineer extends a warm wave to his photographer!